The threat of foodborne illnesses has led to the implementation of strict food safety regulations. According to the World Health Organisation (WHO) it is estimated that one in ten people suffer from a foodborne illness every year. More worryingly, 420,000 people around the world die each year from such illnesses, including 125,000 children, who are more at risk. With the globalization of food production and supply continuing to increase, manufacturers are under pressure to ensure their food products meet the requirements of not only their own country, but international food safety authorities. Food safety refers to procedures and regulations to prevent the contamination and poisoning of food products. This necessitates meeting specific requirements in terms of preparation, handling and storage of food, to ensure the risk of foodborne diseases is reduced, which are enforce by bodies such as the FDA, USDA and 3-A Dairy and Food. Accredited testing services and laboratories are in place to ensure these requirements are met, and equipment manufacturers work closely with these bodies to identify and meet standards. 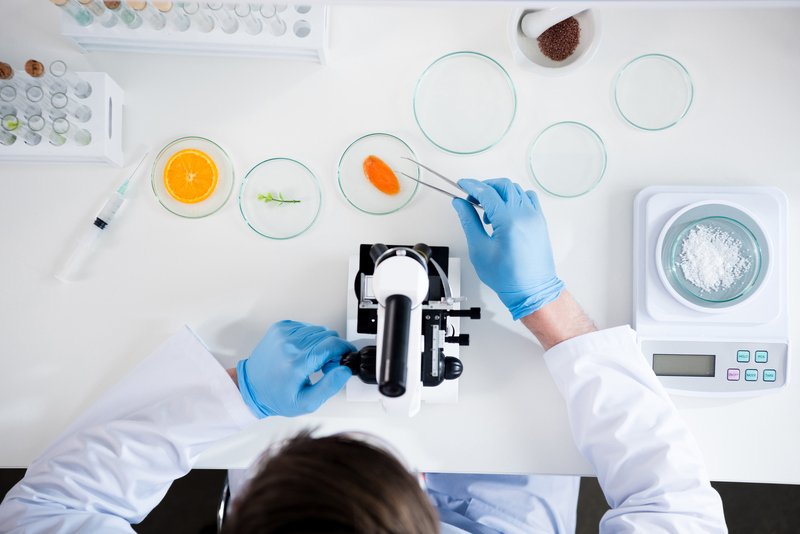 Progress in regions where food safety testing is already established is expected to anchor this growth, as companies continue to be audited to meet standards under the Global Food Safety Initiative (GFSI). The Food Safety Modernization Act (FSMA) in the U.S.A in 2011, as well as measures put in place by the Food Standards Agency and Europ ean Food Safety Authority, has increased the demand for food safety testing services in North America and Western Europe. However, developing countries still suffer from a lack of regulation and proper testing mechanisms, which can compromise trade between territories and provide problems for the growth of food safety testing services. Things are slowly improving however, with the Asia Pacific region as well as emerging nations such as China, India and Brazil starting to see significant growth in the food safety testing market. This is driven through increased awareness among all parties - from governments and authorities to the consumer - of the importance of safe food products, as well as the need to protect the environment. This growing concern over food safety and sustainability will continue to see governments around the world invest further in food safety regulations. When considering prevention mechanisms, sanitation control is a key concern for food manufacturers. Key concerns lie in the quality of incoming materials, condition and cleanliness of food-contact surfaces, prevention of cross contamination and the control of employee health and hygiene. As modern-day processing technologies continue to develop, a range of sanitary and contained food sieving and filtration equipment is now available to meet food industry regulations. The raw materials used in the manufacture of food products should be checked before entering a production line. Despite regulations increasing to protect manufacturers when importing raw materials from developing countries, certain procedures can be put in place to ensure the quality of raw materials and food ingredients used at entry point. Quality checking at this stage not only protects the food product itself but can also protect downstream equipment and the risk of cross contamination. A range of check-screening equipment is available for auditing incoming materials, removing contamination before it can enter the process line. The Russell Compact Sieve® range of vibratory sieves removes all oversized contamination and is ideal for high-capacity screening of incoming ingredients. The cleaning of any equipment and surface that comes into contact with food is an integral part of any sanitation programme. In some instances, these programmes are not always fully carried out, due to tiresome cleaning procedures, cumbersome machinery or equipment that is difficult to fully sanitize. Russell Finex has developed a range of sanitary sieving and filtration solutions that meet food industry processing requirements in terms of sanitation. 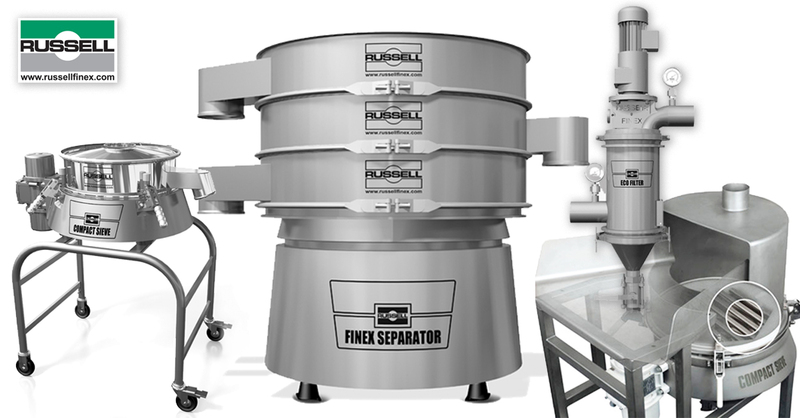 Russell Finex’s range of industrial screeners, grading separators and inline liquid filtration has been engineered to provide manufacturers with machinery that is quick and easy to dismantle and clean, without the need for tools, designed with minimal food-contact parts which are crevice-free. Cross contamination can be a factor in the spread of foodborne illnesses. Contamination can be spread through various entry points, from equipment and production areas to operators and product containers. 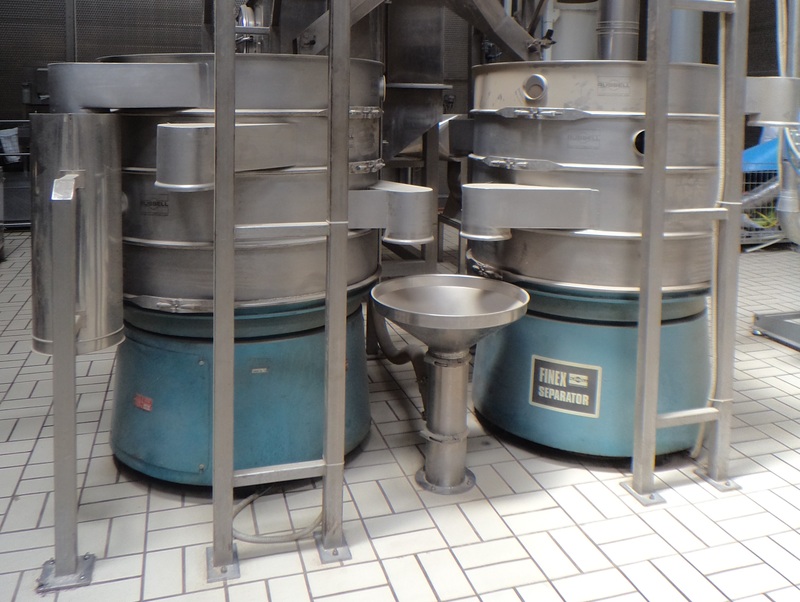 The sanitary design of a food production line is also an important part of preventing cross contamination, addressing both bacterial and allergenic issues and, as mentioned, the easy-clean design of Russell Finex separation equipment is a key factor in providing sanitation. In addition, these vibratory screeners, grading separators and industrial filters can be fully-enclosed to protect products from contamination, as well as eliminating the spread of potentially harmful dust and fumes into the production environment. As well as monitoring the materials and equipment used in food manufacture, it is important to protect production operators, and ensure the equipment is user-friendly and safe. Contained sieving equipment and enclosed self-cleaning filters equipment not only protects the product from potential contamination and the spread of illness from food handlers, but in turn protects the handlers themselves from potentially harmful dust and fumes. Moreover, as well as providing equipment that is easy to disassemble and clean, the Russell Compact 3in1 Sieve™ is available to meet manual handling regulations, with a low-level bag tipping platform. Russell Finex has over 80 years of experience in providing sanitary sieving and filtration solutions for the food industry. A range of hygienic equipment has been designed and manufactured to adhere to the most stringent food safety standards. 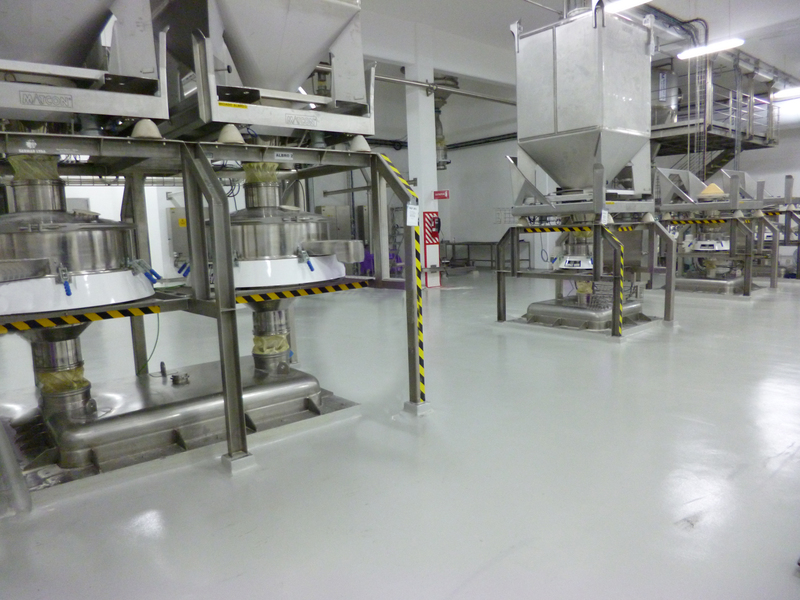 The company has built relationships with major global food manufacturers, to ensure its products meets the modern day needs of food processing in terms of hygiene, operator safety and usability. Contact Russell Finex today to find out more.